Born in Nanking, China in 1926, Reno Chia-Lin Chen grew up in Shanghai, and studied accounting. In 1949, during China's civil war, Reno left Shanghai for Taiwan on less than a day's notice. As a refugee in Taiwan, he joined the fisheries, where he experienced hardship and adventure, and rose from fisherman to captain. After the Free China voyage, Reno attended community college in San Francisco, joined the electronics industry in Silicon Valley, married, and became a U.S. citizen. He began his long career at Ampex Corporation working on the assembly line and retired as a distinguished engineer of the research staff. Reno and his wife Iris raised their three children in Palo Alto, California. Born in Peiping, China in 1926. Paul dropped out of school at age 17 and went to sea at age 20. 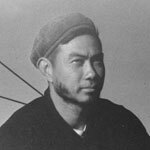 He ended up in Taiwan in 1949 in a chase of tuna.Â Paul initiated an adventure in 1954 that became the Free China Junk story. 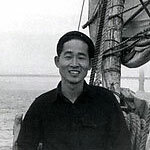 After the Free China's arrival to San Francisco, he enrolled in San Francisco City College and later received a BA from University of California at Berkeley and a PhD from Northwestern University and taught physics until 1994. After his retirement, he devoted his time in writing. He is currently seeking a publisher for his vivid manuscript on the journey of the Free China. Parents of three children and grandparents of four, Paul and his wife now live in Northridge, California. 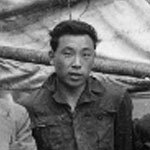 Born in Beijing, China in 1926, Marco graduated from the Chinese Academy of Fishery in 1949 and began work for the Republic of China's Department of Commerce, Fishery Division. 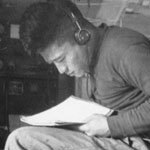 Aboard the Free China, Marco wrote daily love-letters to his sweetheart Mary, bound in a book. Following the voyage, he swiftly returned to Taiwan to marry her and received the first ever Outstanding Young Person of the Year Award from the Republic of China. In 1978, Marco immigrated to the United States with his wife and two children and settled in Southern California in 1980. Owner of several businesses, his ultimate joy came from watching his children grow up, get married, and be surrounded by the love of his five grandchildren. 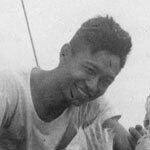 Born in Swamei, China in 1926, Benny went to Taiwan with the fisheries in 1949. After the Free China voyage, Benny obtained a degree in Marine Biology from University of Washington. As part of his research, he disproved the common belief that all salmon return to the river of their birth. He also served as a fisheries expert for the United Nations in Barbados. Benny was residing in Seattle with his wife and daughter and studying for his doctorate when he died in a car accident, age 40. Born in Yangchow, China in 1924. Huloo was transferred to Taiwan with the fisheries in 1949. After the Free China, he studied in Japan before returning to Taiwan. In 1967, Huloo immigrated to Christchurch, New Zealand as a fisheries consultant, followed by his wife and two children. 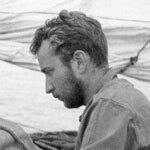 While working with the United Nations Jamaica in 1970, he was called upon to locate Thor Heyerdahl's reed vessel the 'Ra II', which had lost its position in the Atlantic on route to Barbados. Huloo is credited with a long list of fishing inventions. In his retirement, he has devoted himself to teaching T'ai Chi Ch'uan for health. In 2002, he was awarded the Queen's Service Medal for Community Service in New Zealand. Born in Sacramento, California in 1928. A graduate of Berkeley, Calvin's first posting as American Vice Consul was in Taipei. After the Free China's arrival to San Francisco, Calvin returned to Taiwan to resume his career as a US Foreign Service officer. It was his brother Charlie and family who helped to look after the junk-mates in California. Calvin's diplomatic career spanned more than twenty-five years, including postings in Saigon, Bangkok, London, Warsaw, Monrovia, Liberia and Washington, DC. He is fluent in Chinese, Vietnamese and French and has also kept up his hobby as a filmmaker. Calvin and his wife live between San Jose, California and a cabin in the Sierras.